Replacing the carpet in your home can be a costly endeavor. However, this needs to be done every 7-10 years on average. When you end up replacing your old carpet for new, you want to do everything in your power to extend its life. Go Green Carpet Cleaning & Restoration is here to share some simple tips that can help you extend the life of your carpet. It might seem like it will inconvenience people by asking anyone coming into your home to remove their shoes, but you may not realize how much dirt and other debris transfer to your carpet from the bottom of shoes. There have been a number of studies that show it takes up to 17 steps before all the grime on the bottom of your shoes transfers completely to your carpet. This means that a rug at the entry of your home won’t even be sufficient. This dirt and debris found on the soles of your shoes will eventually make its way to the backing of your carpet and damage the fibers. This dirt will also make your carpet look dingy and lose it sheen. Many people don’t realize that they may be vacuuming wrong. When you are vacuuming with a vacuum that is bagless, your container should be at least ½ empty. Your beater brush should be free from hair and lint as well for your vacuum to efficiently do its job. Vacuuming should also be don 2-3 times a week. While vacuuming areas that receive a lot of foot traffic, you should be taking at least 4 passes with your vacuum to get all the fine dust that settles into your carpet. For areas that are lower in traffic, you can get away with 2-3 passes. When spills happen, which they always will no matter how careful you are, they should be cleaned right away. This will keep them from settling deep into the carpet fibers. When cleaning them, always blot and never scrub to avoid damaging your carpet and causing the fibers to break down prematurely. You will find that when you rotate your furniture it changes the traffic patterns in your room. This will help you carpet to wear evenly. You don’t want to see heavy traffic patterns in your carpet and this is how you avoid that. You should be rotating your furniture every 6 months to avoid these harsh traffic patterns. Having your carpet steam cleaned by the professionals at Go Green Carpet Cleaning & Restoration will help keep your carpet vibrant and free from damage. We have the training and industrial strength cleaning equipment to remove any stains from your carpet no matter how severe they may be. Don’t hesitate to have your carpets professionally cleaned. Call us today! We all know that having carpet in your home is something that you need to care for and clean regularly. The cleaning of the carpet includes running the vacuum often to remove dirt and debris that can stain and damage the fibers. You also need to clean those pesky stains and spills that always seem to occur often. The treatment can be different for each depending on what type of stain you are dealing with. If you have wax you need to use heat whereas if you have gum you need ice. The treatments can and will vary quite drastically so it is good to know what to use for each kind. This is not the only problem that you will run into when dealing with carpets. They can also be a home to some unwanted guests. These guests are pests that can not only be harmful to your family but to your carpet as well causing permanent bald spots. What pests are in your carpets and what can you do about it? Carpet Beetles: The most common pest that you may come in contact with on your carpets happens to be the carpet beetle. The carpet beetle is common and is something that can be a problem to your carpet because of the damage they cause. The great thing is that they are not harmful to you personally but can cost you money when you are required to replace your carpets early. The carpet beetle lives in the fibers of the carpet and that is because that is their choice of meal. They love to eat the fibers and as they do they cause damage. The fibers will star to be destroyed and you can end up with holes and dead patches on the carpet. These bald spots are often the first sign that you have carpet beetles. You want to be sure that if you suspect carpet beetles you have your carpets professionally cleaned immediately. Fleas in Carpet: The next pest that can be a problem for carpets is the flea. They are a pest that is often thought to be a problem for pets but that can be the way they made it in your home. During the cold months they need to find a place to overwinter and live and your nice warm carpet is a perfect match. The problem is that the flea needs to have a meal of blood but have been known to live for up to a year without it. If you spend time on the carpet you could be bitten by the flea and so can your pets and other family members. Many pests can be found occasionally in your carpets. They might be looking for a warm spot to live or looking for food to eat. If this happens you will need to have your carpets professionally cleaned to remove them. Go Green Carpet Cleaning offers expert floor and upholstery cleaning services. Contact us today! Pets are a part of many people’s lives. They fill our hearts with their devotion, loyalty, and unconditional love. Being a pet owner, has many responsibilities. When it comes to your indoor pet, routine grooming, hair trimming and nail trimming is beneficial to avoid the claws doing any damage as well as the accumulating pet hair. But pets are likely to have accidents inside your home. Whether they are a chronic indoor potty issue, or have isolated accidents because they can no longer wait for someone to come home, pet accidents are common. Most people are only concerned for their carpets and rugs when it comes to accidents, but people should also be wary about tile and grout too. Go Green Carpet Cleaning & Restoration would like to briefly account for the issues that derive from pet stains. Your first response when seeing a pet has an accident is to immediately clean it up. Much like carpets, the longer the accident settles, the more challenging it can be to remove and the more damage it can do. Grout is especially prone to damage where pet accidents are concerned, due to their high porosity. As urine dries, the pH level can reach anywhere between 10 and 12 on the scale, where fresh urine on has a pH level of about 6 for example. The reaction with the surface has an effect of oxidation causing the color of the infected surface can be altered as the pH rises during while urine is drying. If not treated immediately and left to dry for extended periods of time, the damage becomes irreversible and the stain permanent. DIY remedies and even department store products are often inadequate when contending with dry pet accidents, making professional cleaning mandatory for removal. The pet accidents that include pee, poop, and puking has an acidic content that will not only stain, but make the surface susceptible to etching. If the issue isn’t corrected, the etching can easily lead to unsightly cracks and even crumbling. Extreme cases will cause for your grout to be replaced. To offer more protection for your grout and tile; making it more resistant to pet stains and odors among other spills, you can have your tile sealed. More often than not, a professional comprehensive tile and grout cleaning will conclude after a sealing, per homeowners agreement to the service and charge, if not there are many sealants available that homeowners can do on their own. Because the grout is especially porous, and when the tile is scratched, the pet accidents can cause staining as well as allow odors to seep in. Tile & Grout Cleaning, Sealing & More in Glendale, Pasadena, Burbank, Diamond Bar & Agoura Hills, California. With your maintenance and cleaning tactics along with professional deep tile and grout cleaning services, you can better keep your grout vibrant and fresh. Staining and odors are a major issue, but pet accidents can easily spread bacteria, making the grout a perfect breeding ground for it. Not all DIY methods are efficient enough to neutralize the bacteria, so even if you manage to remove any stains and odors, periodic tile and grout cleaning services should still be in place to effectively disinfect the tile and grout. If your tile and grout hasn’t been professionally cleaned, call in the experts of Go Green Carpet Cleaning & Restoration to clean, sanitize, and deodorize your tile and grout, especially if pets are in the home. Your home is a place that is in need of cleaning and picking up to keep it looking good. Most people spend time each day straightening and cleaning some aspect of the house. One area of the home that needs to be cared for and cleaned as soon as a problem occurs is the carpet. They are used every day by everyone in the home and that means that dirt, debris and stains will start to appear. The stains and spills need to be cleaned so that they are removed without leaving any permanent damage. Once you have cleaned a spill of some sort you assume that it will stay gone. The problem is that there is something referred to as recurring stains! That is when a spot that you cleaned comes back! This can be extremely frustrating and you may be wondering what could cause this. Carpet Wicking Stains Are Recurring: You can tell you have had a stain come back if it reappears after you have cleaned a spot and it comes back when the carpet has had time to dry. The spill usually hits the carpet and will soak into fiber, backing and padding. The longer the spill has to sit on the carpet the further it will make it down into the backing and padding. When you come along and clean the spot or spill off the carpet you are essentially getting the top layer of the spill clean. The carpet will look and seem clean to the eye but the spill is still there. 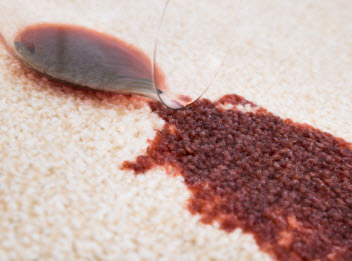 As the carpet dries from the cleaning process the same spill will appear back on the carpet right where it was before. The spill basically soaks back up through the backing to the fibers. You need to deep clean a spill that has had time to soak all the way into the padding and backing. This is best left to a professional that has the ability to use commercial grade equipment to suction out the liquid. Brown Spots & Pet Stains that Keep Coming Back: Another common way that a stain will show back up on the carpet is what is referred to as rapid re-soiling. 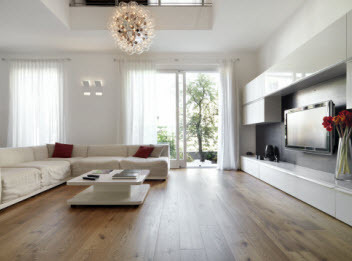 This is due to the cleaning solution and process that you use to clean the original stain. The process that you use to clean the spot may be great at getting the stain out of the carpet but is leaving behind residue. The residue is what will cause the carpet to be sticky and that allows debris and dirt to re-attach to that area with ease. The original stain will be gone and could be gone for some time. The spot shows back up as you use the carpet to walk and live on. The dirt that you are bringing back in the house will attach more to the area that has the residue than the rest of the carpet. That makes the spot seem to reappear. Go Green Carpet Cleaning & Restoration offers expert floor and upholstery cleaning.